I like this chapter. We will discuss the ideas about how our solar system became until the day we die, as we will never really know but the Red Sun can not have to many logical options. Gilligan has followed his logic path here and obviously will back it up futher. The idea of a Red Sun due to dust makes sense. Either from the chaos as he describes, from any other Catastrope theory or/and perhaps with an active electric Solar System and its plasma creating lots of dust. Who knows. The sun does go red when it sets and also after massive forest fires and krakatoa. The dusty epliptic haze/cloud would concentrate on the suns equatorial plane and we would view the sun through the thickest part of the sun. Unless the Sun was not the same then 9much weaker or the planets more charged,) the Sun was one of the other gas giants or the Earths orbit in the chaos was not on the Suns equatorial plane like it is today. Would the reduced glare/heat of the sun also mean more water in the atmosphere and in the land, especially for Egypt? Can this explain why the Sahara was green, why Egypt had more lakes and rivers before? Also, if it was a universe in chaos and electrically unbalanced would they have built the temples/pyramids to harness the energy? The reason why around the world the ancients all constructed these megaliths? And now the solar system is in balance they are not as energetic as before. Kevin, perhaps you are seeing things 4-D. In 4-D with time as the fourth dimension, change would be seen as a curve. Also as the object changing went away in time, either forwards or backwards, then it would appear to diminish creating a curved effect. Anything moving in a circle would appear as a spiral. At any moment 4-D would appear 'set' or solid and this leads to the question of fate and free will. I certainly consider that the ancient Egyptians could have seen what you see, especially with the greater magnetic field of those days. But it is the sense of cycles and the frequencies of those cycles which particularly interest me. Like thge Mayan used 260 days, and a lot of other numbers in their depictions. Where are the Egyptian numbers. How cold the Earth must have been during very dusty conditions. Could the Sun's corona be seen under any conditions ? Now this is stretching it. All the dust would be like a dust storm now. If the Sun looked duller, then Venus would appear duller too, even as a blazing comet. This is why I like Jno Cook's idea of the Duat being a circle in the sky at night, produced by the Earth shading that circular area. One old Egyptian could not see through the lit-up dust, but she could see through the circular shaded area - the Duat. The Sahara was green in the Saturn System because water was electrically held in the atmosphere, and heat and light was provided mostly by the four Birkeland currents that passed over and possibly through Earth. This provided womb-like conditions over most of the Earth, even in Antarctica. This is a fundamental aspect of the Saturn System in my view, but not all agree ! I think that the original pyramids were constructed in the Saturn System, with various levels of technology, to depict what they saw - a world mountain that was layered. A plasma phenomena. A lot of other ideas and possibly electrical technology was probably incorporated in these pyramids also. Later peoples were probably awestruck by the old pyramids, and repaired them and built copies and held ceremonies, etc there. Pyramids are obvious candidates for time chests too. But all this is just my view. And clearly the Saturn System persists in my views, whereas others are against it. Mo, sure earth’s atmosphere contained a lot of dust, much of this sourced from the now extinct volcanoes running down the Sinai Peninsula and the Santorini volcano (volcanoes embodied in the god Bess), but I’m more referring to the dust and gasses littering the ecliptic. For me, any form of cosmic chaos would produce countless tons of dust and debris. This falling into the plane of the ecliptic and taking hundreds if not thousands of years to clear up. This stuff hazed the sun red thus granting my close proximity planetary god kings visibility at any time during the day, even near conjunction i.e. no glare as experienced today. Close proximity bodies, tidal friction warming up the earth, this more than compensating for the hazed red sun. Definitely moist as evidenced by the Egyptian goddess of moisture Tefnut 'She of Moisture' (interestingly no god of rain though). Moisture, I believe more to do with Mars lost oceans than anything earth generated (i.e. evaporation). >Could the Sun's corona be seen under any conditions? Absolutely, the highly active hotter corona was clearly observed along with solar Flares, prominences and CME’s. Such phenomena were seen to lash out into space several times the diameter of the sun. This was embodied in the Egyptian cobra who was said to spit fire and venom at Egypt’s enemies. It was pictorially represented by painting a thin yellow ring around the sun to form the body of the cobra, to this a tail and head were added as can be seen here. Where else would the idea that snakes spit fire originate, and why drape a cobra over the sun in this way? I think I am hinting at there being the last ice age during the dusty times. Then maybe the Atlantic currents could have changed, as is always being postulated. But I see the Earth, previous to these times, being in an elliptical orbit producing the periodic ice ages. Now I think Venus would have been extremely bright in the dusty times, so that it could have been seen during the day, but the dust would have hindered such viewing. And maybe the ring around the Sun was an optical effect due to refraction, rather than the corona, however giant flares would have been quite likely in those days, and these might have been very visible. If there was dust generated by interplanetary thunderbolts, then it is odds on that there was a lot of water thrown into space too, water being polarised. Such water would tend to get together pretty quickly, and perhaps that is what Tefnut was, but that is a wild guess. I do wonder often when Mars lost it's water and it's life. Red Sun in the morning Pharaohs warning! if the immense dust was concentrated on the suns equatorial plane, similar to the planets orbits, then looking at the sun would make it red but other objects to the sides, especially to the horizons would not be seen through so much dust? colour change of the sun and the planets due to solar circuit? If a series of vibrations builds relative to the sun it may turn red, or even go out totally, in the blink of an eye. The cycles of the serpents flows will be so huge compared to our lives , but unless We recognise them , then they will not exist at all, once You "SEE" them then it sort of makes sense and becomes simple. The serpents are vibration flows, they travel upon geometry that forms polygons in 2D, each polygon rotates in opposite direction so the flows have serpentine pathways, I have the advantage of following the serpents with ease, then it just hits you the spherical implications as they travel about in ever larger geometry. could the change in the suns colour be be due to something else? suns change colour and size due to the electrical energy/stress - if the solar systems circuit changed would this change the sun? if it went giant and red then this might be an answer. i think Plasma Cosmology says we might have lived in such conditions before during the Golden Age? If You stepaside from the male dominated explosive /collision/big bang stuff, and think in a female sense. Then dust could simply formulate in a change of flows as they cross onto different geometry, all is ONE, a sea of STUFF that is all, can be transmuted into any element. If a pinch point was arrived at by our local solar system where the attraction and repulasion forces of an even larger geometric system encouraged a switching about , similer to when trains meet switching points on the rail, the geometry pathways would permeate and alter right through all involved. It would appear to the observer here on the surface of Earth as though a battle in the heavens was raging, and in our 3D perspective we would asign the reason to physical mass, but what is mass? Our senses are short distance survival ones, colour is simply used to recognise what We are accustomed to seeing, it is assumption to presume that all colours were then as now, that the condition permeating this planet was as now, We are too short lived to SEE the alterations, and only the stone actually manages a long enough time span to SEE the differences. Tutankhamun's pectoral - brooch or mars? Tutankhamun's pectoral - broach or image of Mars? one thing i have noticed is that especially dust but sometimes mineral and water are being formed where there are EU events happening in space and perhaps on earth. i also think about how much dust has been created on earth to keep burying things and that rain is sometimes very dirt (i know it can be blown up into clouds but every time?). so are you saying on a real simple level something like when you have mutliple waves interfering with each other, constructive and destructive interference, that the different vibrations/frequency changes the stuff into something. so it becomes something else depending on what is happening around it? due to the local micro and macro geometery the same event would flip in and out different things? you point about remembering that conditions and things change is important. i keep looking at my gEUlogy stuff and thinking of what happened to it but imagining the world today. so wrong. the other thing is that names/words really do limit something and nature. as soon as you name it that puts boundaries on you and how you see/think/interact with it. but how can you describe something to someone else without using some words, even images unless a photograph frame it in. What I sense occurs is creation of elements relative to the inputs on the geometry. The geometry is there permeating the whole, but it depends on the specific resonance flows levels what that element will be formed. Remember I see all as one, and movement that we now consider in an independant manner as been switching, where nothing is moving , but is switching from point to point . This concept is easier with an electrical base to all. ONE sea of a substance that can be anything, and is anything because nothing is seperate at all, all apparent movement is switching, and the force that allows that switching is in duality slightly out of balance. that out of balance creates a constant chase, and as local areas of the one stufff orientate into elements they also formulate a surrounding field that empowers the stuff to re-orientate to become what is remembered within the field bounderies, thus a living object has its own field, but will be within fields and fields and fields, all expanding out to galaxies and universes. The movement is not of an object, but of a fluid switching from point to point in whatever this stuff is, all the so called speeds such as sound in atmosphere will be switching rates . A tree does not grow, it converts ever more STUFF about itself into the orientation that becomes the tree, the energy of the duality of lifeforce required to maintain this is imploded into this re-orientation, We release this by burning wood. The tree is a conversion device that locally within it's unique field pathways manipulates the flows in such geometric orientations that the elements and compounds of that are the tree are enabled to form in that field. We create our own unique field that does exactly the same, all living entities do, and the planet is alive, thus as the life force leaves anything it converts to that of the planet, and the planet will locally re-orientate the sea of stuff to become whatever relative to the field flows condition, thus a diamond will form in the geometry relative to a diamond, it will then maintain such by having the life force feed it constantly in the unique field structure relative to diamond, all this will be occuring at such speed that we cannot percieve it. Thus the plane5t is moving, but is not moving it is switching and been maintained within its field . Going up in scale thus the sun could convert to whatever relative to any alterations to the galactic field patterns it switchs along into, the galaxy can morph to whatever as universal field flows alter and they all act symbiotically all the way down to the pimple on your nose. that thou canst stir a flower without troubling a star. When we consider Mars in relationship to Earth in those ancient days of Amenhotep, we make some assumptions. that it appeared that a colourful winged beetle arose out the ground, just as depicted. conical sheath of Earth. All good reasons for godly status of Mars. Mo, thanks for the heads up and Mat thanks for featuring my work, very much appreciated. I believe Mars only 5,000 years ago was home to human life. It was a planet was as vibrant as earth today with millions of people sharing similar lives to that of you and I - no bulbous eyed little green men, but humans having the same thoughts, fears and insecurities as we have. If the dating of Martian rock is anything to go by then they were probably more technologically advanced than us. Perhaps evolution on Mars actually developed in a straight line, unlike the missing links here on earth. What happened? Impending chaos was probably foreseen however, due to the scale of cosmic catastrophe, predicting the outcome was impossible. That said, one thing ‘our ancestors’ were sure of and that was... Armageddon, this was end of the world and probably the end of human life in the Solar System. I mean, what do you do when you realise at the very least your planet is about to tossed into a washing machine for millennia and then tumble dried with the setting on melt?! Fortunately for us, there was a frozen rocky planet we know as earth. Rocky in the true sense of the meaning, in that earth at this time was basically one great land mass – Pangea. Ensuing chaos between Mars and earth would see this great land mass split into segments to form the continents (tectonic plates) we recognise today. This would explain why the ocean floors look surprisingly new and offer an explanation to how the Clovis people made contact across the great Atlantic, they didn’t, they simply walked. Encounters with Mars would see the transfer of its vast oceans and volatiles. This mainly occurred above the Trans-Himalayas as Pharaonic Mars locked into a geosynchronous orbit around earth, thus artificially and suddenly dragging up the mountains. The dust and volatiles formed an enormous cosmic ‘tree’ stretching out into space. It was observed by ancient cultures who duly represented it as a sacred or ‘stylised tree’ with a winged disk (mars) above it (prevalent throughout Mesopotamian cultures), sometimes flanked with griffins. The Egyptians saw it as “Horus in the horizon” i.e. 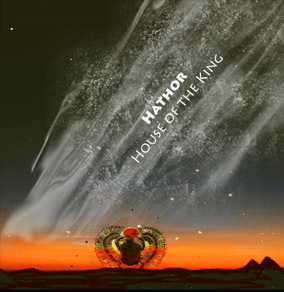 the king as the embodiment of Horus literally ‘in’ the dust and debris of the horizon. Mars probably appeared as Tutankhamun’s broach in the image above (Tutankhamun “living image of amun/aurora” = blue, hence Tut/Mars wearing of a bright blue wig) with the ‘tree’ appearing as a cosmic scarab from the local of Egypt. I’m more than convinced the Christmas tree has its origins in the cosmic ‘tree of life.’ Passed down via pagan beliefs. Anyway, prior to the emergence of the aforementioned cultures pockets of people from Mars somehow made it to earth. How? Obviously spacecraft of some kind. Where are they? Haven’t a clue but the journey was somehow made and the intelligent gene was sown. This was no ‘Hollywood’ migration with “the next shuttle to earth will be leaving in T minus 1” crap. On the contrary, millions of people died on Mars, only a select and fortunate few made it to earth. The evidence? Probably vaporised along with the Martian flora and fauna although I’m optimistic evidence of human life will one day be founds on Mars. Probably in the form of ruins with a Mc Donald’s sign, or perhaps a partially buried ‘planet of the apes’ statue of liberty. We have to remember Mars has been literally torn inside out, a needle in a haystack would be a luxury. No sooner had the Martians landed than they were almost wiped out. Many times the clock was set to zero but we survived. The migration of humans from Mars is to coincide with the emergence of civilizations around the globe 5,000 years ago. Why wasn’t earth colonised sooner? Don’t know, I can only think conditions were not conducive for human life, not enough oxygen perhaps? Frozen earth? Who knows? Our ancestors brought with them domesticated animals (embryonic state?) grains, fruit etc. All previously undergoing genetic modification (or GE) previously on Mars. Ancient cultures do not just suddenly ‘domesticate’ animals, they hadn’t the ability, they were not genetic scientists. It was all done on Mars. This is why apples, bananas and pears, etc. are the perfect shape for human hands and most livestock today wouldn’t survive without humans. Much of this appeared 5,000 years ago, this is no coincidence. The above could be written better but you get the jist. Hello , great to read through your site. As an aside , has your delvings into Egypt ever thrown up anything about these little handbags? the self same handbags are on one of the goekli tepe stones, and I consider they are resonance devices similer to the bells associated with the dorje. watch which hand they are held in, what height, and look at the layering shown in the left hand photo of one of the depections, basically I find alternate layers at different height above surface. This dorje imho will have been capable of slicing through solid rock, a little like a projected laser beam of resonance of one half of a duality. These flows of duality imo are birkeland currents circulating this planet, they are the serpents, they are the dragons, they will transmute planets.